Oh, the summer time is here!!! And the Gaelic Culture world is waiting for you to hum in!!! That’s right – in Summer 2018 Experience Gaelic Games is sizzling, just like the weather this week. Experience our Gaelic Culture and be part of it. Play the games and enjoy the atmosphere their played in. 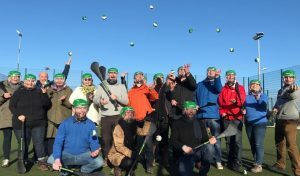 Experience Gaelic Games unique and fun filled packages will see you spend your quality time learning a new skill, whilst enjoying the wonder of our greatest and most cultural activity with a fun difference in Dublin. Why not spend a day in the Gaelic World! If you want to try something different, fun and cool when visiting Dublin then Experience Gaelic Games is the place for you! Culture and sport are interwoven in the Gaelic Culture sphere. It’s much more than just sport. It’s a way of life. We want you to realise the powerful connection between our ancient culture and out present pastimes. Not only that we want you to relish the opportunity and blossom in the Gaelic way of life. Let us lead you forth into a world where sport is to be enjoyed and savoured. Savouring is fundamental as you will be playing the world’s oldest and fastest field sport in Hurling. It’s not a real summer trip to Ireland if you haven’t swung a hurl or kicked a point. Experience what makes Ireland sizzle this summer with Experience Gaelic Games. Come to us and we’ll get you playing!